HÀ NỘI — Around 115 experts from Việt Nam and France are attending a three-day conference on breast cancer, which began on Wednesday in Hà Nội. At the conference, the 100 Vietnamese and 15 French experts will share experiences on diagnosis, treatment and surgery for breast cancer. Also, Dr Bosc Romain from Henri Mondor Hospital in France will share a plastic surgery model for patients who have undergone mastectomy. The conference is an excellent opportunity for local experts to learn from the experiences of their French counterparts, especially with regards to breast cancer prevention and control, Ministry of Health Nguyễn Thị Kim Tiến said. The ministry will create favourable conditions for French experts working in Việt Nam as well as for Vietnamese medical workers who wish to study in France, he added. Speaking at the opening ceremony of the conference, Associate Professor Trần Văn Thuấn, director of the National Hospital for Cancer, or K Hospital as it is known, said the number of cancer patients across the world, including Việt Nam, is rising. In 2000, data revealed that Việt Nam saw 69,000 new cases of cancer every year. That number has now reached 126,000, with 94,000 fatalities every year. It is estimated that Việt Nam will see 190,000 new cases of cancer every year by 2020. Breast cancer is the most common cancer among women, Thuấn said. As per the hospital’s latest study, the ratio of breast cancer patients is 28.1 per 100,000 women. 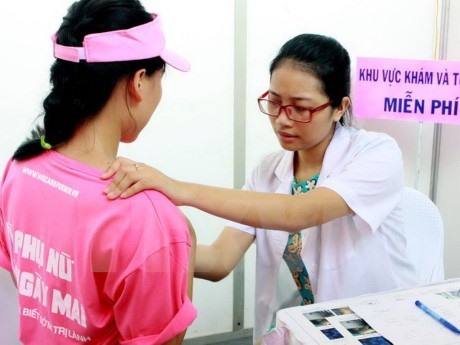 “In recent years, cancer prevention and control in general, and breast cancer prevention and control in particular, in Việt Nam has seen good achievement,” said Thuấn. With modern equipment and technology, there’s early diagnosis, and that eases the treatment period, he said. As a result, treatment costs have reduced, and patients are living longer.